← Ramen with the Waaaaaabich! 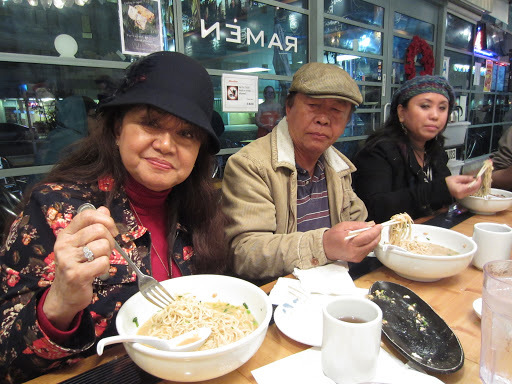 Ramen Newbies – My parents! 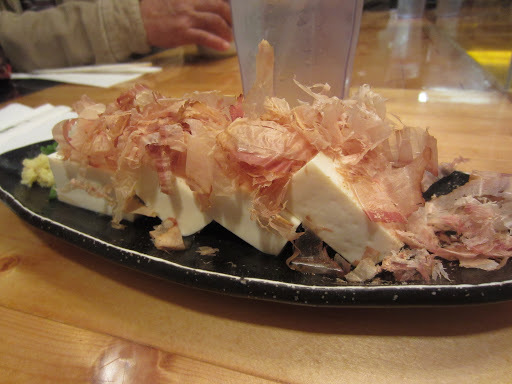 My sister from Hawaii was in town during the holidays and we spent a lot of time going out to eat. My sister is a devoted ramen run reader and has been on ramen runs with myself when I was in Hawaii, and I’ve always wanted to take her on ramen runs here in California. 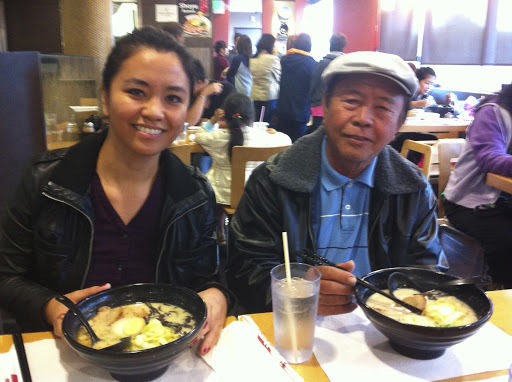 The first place I took her was Ajisen in Hacienda Heights, along with my dad, who has never tried real ramen! 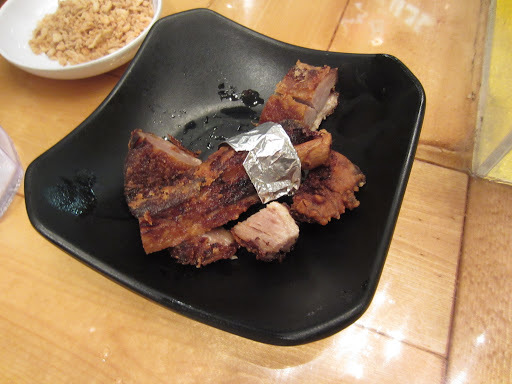 My sister ordered the Seafood ramen, I ordered the BBQ Pork ramen and my dad had the Ajisen ramen. 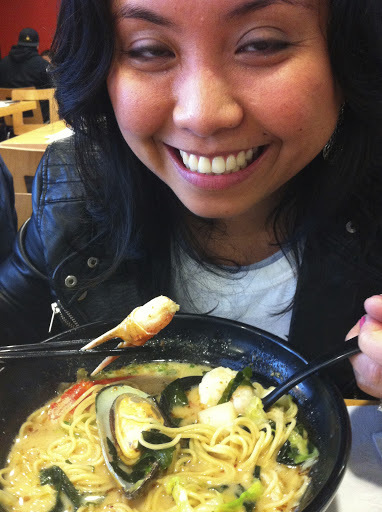 My sister is definitely enjoying her seafood ramen. Just a little fact about my sister. She is ALLERGIC TO SHELLFISH. But that doesn’t stop her from eating them! She always says, “that’s what Benadryl is for!” I admire her persistence. My dad said he really enjoyed the ramen. It was not like any ramen he’s had before, since all he’s ever had was Top Ramen and Cup’o’noodles. Some time after that, I took my parents and my sister, along with Sean, on a tour of Pasadena. 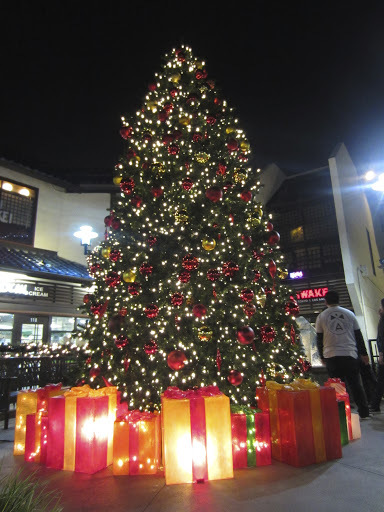 We had a quick snack at an Italian deli and caught a Christmas lighting ceremony in Pasadena. It was still early and we were starting to get hungry again, so I thought we’d catch the train to Little Tokyo. 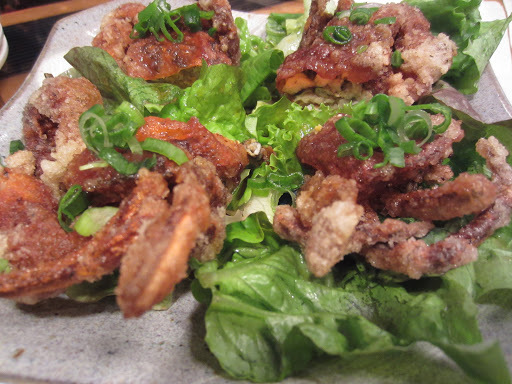 And I had to take them to Shin Sen Gumi. 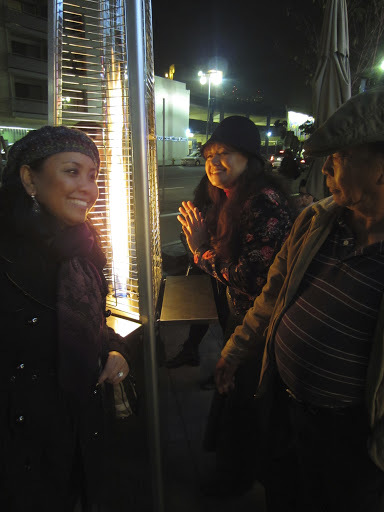 My sister and parents trying to warm up outside of Shin Sen Gumi! I had everyone order their ramens the way I would. Strong broth, light oil and hard noodles. And it was delicious. Everyone thought it was delicious. SSG in Little Tokyo never fails to satisfy! My mom loved everything we had at SSG especially the ramen. The only complaint she had was she did not like how the server said something out loud in Japanese followed by “fork.” My mom was slightly embarrassed to have asked for one. 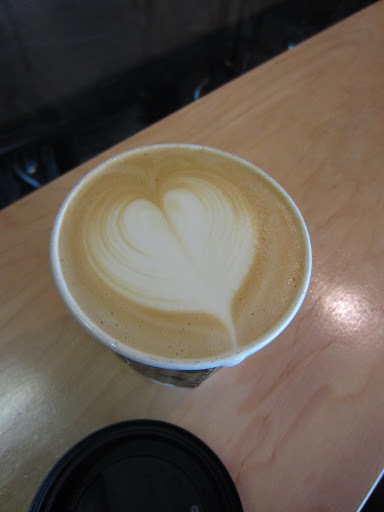 And you cannot end a Little Tokyo trip without some coffee from Cafe Dolce. One of my favorite things about going on ramen runs is introducing people to ramen for the first time. 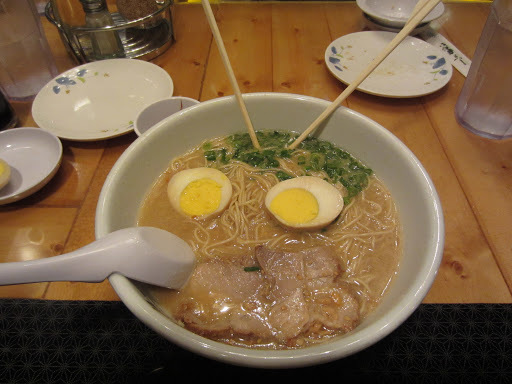 Most people I know are not aware of the wonders of real ramen and I get a kick out of seeing satisfaction on my friends and family’s faces when they have it for the first time. 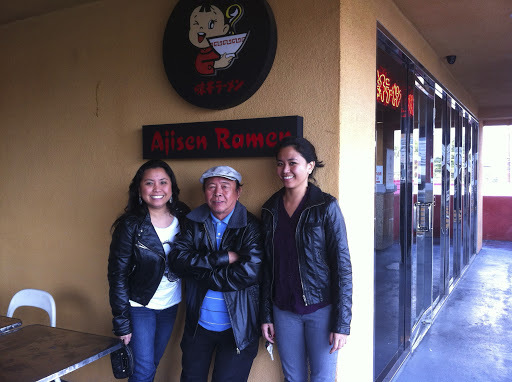 I’m so glad I got a chance to take my parents on ramen runs and that my sister finally got to experience ramen in California!